As some of you may know, I have been in bed all week suffering from Bird Flu. It isn’t bird flu, of course, but it is something between a very bad cold and mild flu. I have all the aches and pains of flu, but I can enthusiastically wave at my next door neighbour in his garden. I can pin-point exactly where I got it from however: the Citroen dealership in Fareham. Spending three days in your bed is one of the dullest things known to man, I now realize. I have never been a sickly child, and always thought that a day off school, being ill, was a great opportunity – not to hold up a post office – but read, and read, and read all those books that want to fall off my bookcase. But, of course, with Bird Flu, what would normally be a glorious romp through Bond Street in Mrs. Dalloway, rapidly becomes an episode of Deal or No Deal – crying for no reason and groaning. The only thing I could do, surprisingly, was get onto to my laptop and write these pitiful words to you, whilst browsing on the internet for all the latest news to entertain me. This, inevitably, brings me onto the 80th Geneva Motor Show, which ends next week and is home to a number of exciting car unveilings and glimpses of the future. There’s a new Ferrari with KERS (Kinetic Energy Recovery System), a hybrid Porsche supercar, a pretty little electric Seat sports car, the new Alfa Romeo Giulietta, a one-off Bentley, the new Ford Focus family, and a raft of concept Citroens that, I can be fairly sure about this, will never be made. Whilst being ill in bed and thanks to the wonders of the interweb, I was able to find about all of these cars with high definition photos and videos explaining to me what I was missing; which suits me. 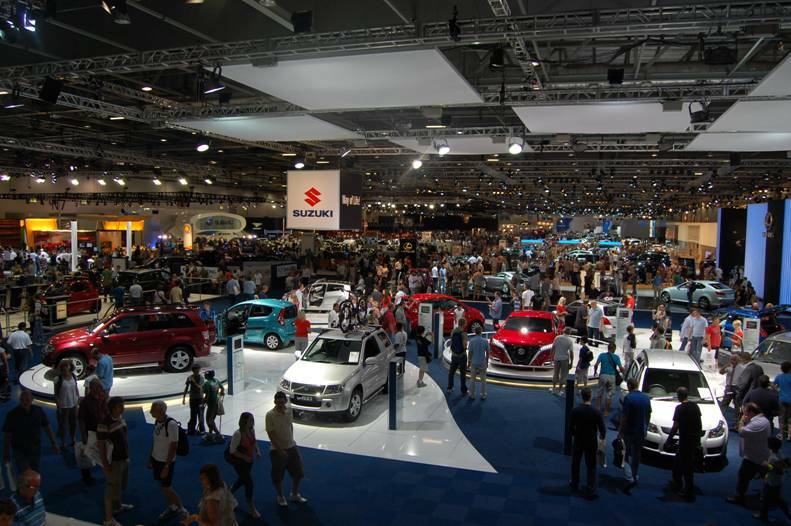 You see, motor shows within the last ten years have changed from friendly, pleasant places to visit, to huge dealerships where, if you didn’t have an interest in buying the Renault Twingo that you were looking at on the Renault stand, five toughies promptly removed you. I remember going to them in the late nineties and coming home with bags bursting with brochures, hats, and pens. Now if you express an interest in the Skoda Octavia and ask for a brochure, suited salesmen ask you all sorts of questions like your name, address and what you were doing on July 21st 2001. So, to escape the suited Skoda man you must go to the other stands that are full of concept cars which, if they are ever made, you couldn’t possibly ever aspire to owning one. I, of course, speak in the past tense, for Britain no longer has a motor show. The good old days of Arthur and Celia going to Earl’s Court to see the new Sunbeam Rapier in the 1950s are gone, so too are the vast motor shows held at the NEC in Birmingham in the 1990s. The last was in 2008 at ExCEL, London, and due to only a handful of car manufacturers turning up, it was a complete waste of time. And also due to its location on the Thames, those toughies from the Renault stand went a step further and dropped you into the drink. So, for that reason, the British motor show was dropped from the list of International motor shows. We were a joke, not worth the effort, an embarrassment. However, it’s not all bad news, for now we have events like the Goodwood Festival of Speed which, along with the multi-million pound racing cars trundling past Goodwood House, also benefits from a selection of manufacturer car stands as good as the cream of Geneva and its friends. And the theme of this year’s event will be ‘Viva Veloce! – The Passion of Speed’ celebrating Italy’s motor racing exploits, and the marque that will celebrate its centenary will be Alfa Romeo. This brings me neatly back to the Alfa Romeo Giulietta. This is a positively mouth-watering creation for its body looks far more convincing than its MiTO baby brother. The interior looks quite simple but snazzy too, with striking air vents, and Alfa’s trademark shapely instrument cluster and DNA system. For people who don’t understand what at an Alfa is, they’ll be at home with the 170bhp, 2.0 litre diesel engine, but for those who do; there’ll be a range of petrol engines including a hot ‘Cloveleaf’ version developing 235bhp. Even the base model is performance minded due to its Fiat-derived 1.4 turbocharged petrol engine, developing 170bhp. The Giulietta is the first Alfa in decades that has a chance of carving out a share of the lucrative hatchback market. The old 147 was a bit of a damp squib compared to the Ford Focus and Volkswagen’s Golf, and was a laughable rival to the BMW 1-Series. However, I can tell you this from the interweb because it would seem trying to get a look at this car at Geneva is nigh on impossible. If you haven’t passed out from ogling the gorgeous girls on the Alfa stand, getting to the car and sitting in it is ambitious, for the entire world’s press are fascinated by it. So, you’ve forced your way through the crowds, your eyes are hurting from the girls, and before you even ask, in your timid-sounding voice could you have a brochure, nine heavies are approaching to eject you. However, if you wait just under four months, you should have access to the Giulietta in the beautiful grounds of Goodwood House at the Festival of Speed, for the car is bound to be the centre-piece of Alfa Romeo’s celebrations. If this is the case, you’ll be able to sit in the car and play with those snazzy air vents until your heart is content, ask for a brochure, and relax in the knowledge that there won’t be any gorgeous girls there – so your girlfriend won’t attack you. A Giulietta might even go up the Goodwood hill. I’m sure that you’ll be so amazed at the new Alfa that you’ll be dying to go and have a look at the competition as well. Fear not, after the motor racing has stopped at Goodwood, pop along to all those local dealerships and relax with a cup of coffee, without the threat of four bouncers removing you from the premises. But don’t go along to Citroen – you’ll get Bird Flu from there.